Then you will love the escape rooms that Breakin has to offer. Me and some others of Love Pop Ups – London we had the pleasure to go along and blog/review about one of their darkest and most creepiest escape rooms The Butchers Lair. The Butcher’s Lair is about Dr. Vladimir Knifesblade. The story has it he was a friendly and very nice university professor. Everyone always enjoyed his lectures on human anatomy and we was invited to his labatory for a dinner party. However when we got there the professor was nowhere to be seen and eery noises came from within the basement. It was up to us to venture into the depths of the basement to solve the mystery. Their other escape rooms are called Blackwing’s Cave, Sherlock’s Despair, The Flying Dutchman, War on Horizon Alpha and Heist Plan. You can read further about these and book via here. 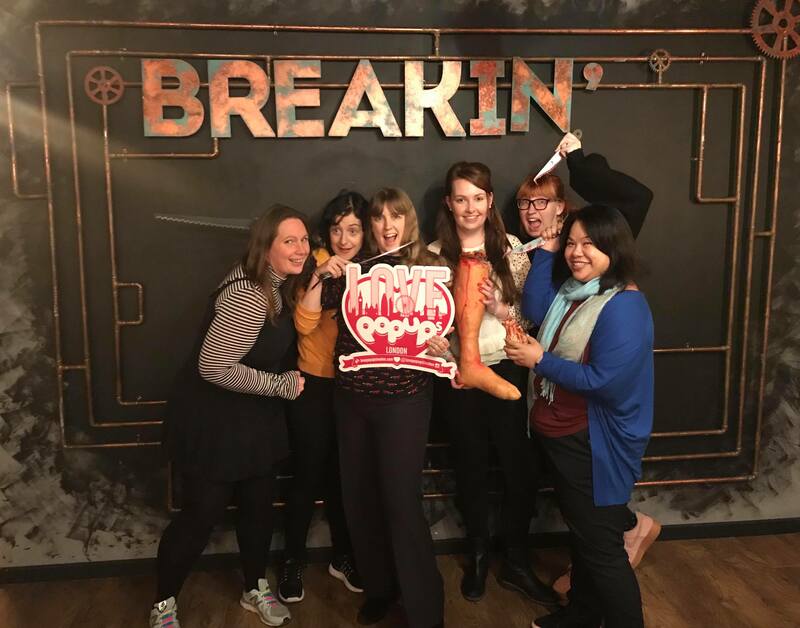 Thanks to Breakin who let some of us from the community of Love Pop Ups London come down to play your creepy yet thrilling escape room. Read our blogs/review from the comments section below. Escape from the Butcher’s Lair 💀for those jumpy players.. Beware! Well this was an escape room, not for the faint hearted, with a butchers lair themed.. wth limbs and blood.. it was a certainly a change from the other escape rooms I’ve done. I liked the idea of the body parts and using them to solve clues, but sadly I wasn’t as much of a fan of this escape room, as others I’ve done. I found that you couldn’t work on two clues at the same time, so often a few people were left waiting around, while the other members of the team worked on the clue. Moving forward, I would say it is best to go as a group of 4 or allow the bigger teams the chance to work on multiple clues. Overall, it was a fun experience and I would be definitely interested to see what the other rooms they have to offer are like. Breakin Escape Room, Butchers Lair. This is not one for the faint hearted, will you escape in 60 minutes and escape being turned into dinner! This was a good escape the room for around 4 people and also for people like a linner game, as you have to solve one clue to move onto the next one. The rooms are themed very well, and there are immersive parts to the game, i was very nervous about things jumping out at me inside the room however here are no live actors in the room so its not that scary. If you need any clues in the game you tap a code into a little device on the wall and it gives you a written clue. This is a fun escape room with various differnt types of locks that require you to also solve some clues like riddles.